Hamburg architect Professor Volkwin Marg presents the first study for the redevelopment of the inner city fringes of the port. The area comprises the majority of the coming HafenCity. In the Übersee Club, Hamburg’s First Mayor Dr. Henning Voscherau presents “HafenCity Vision”, in which the city center regains its waterfront. Two weeks later, Voscherau explains the project to Hamburg’s parliament, the Bürgerschaft. The Bürgerschaft gives the go-ahead for the HafenCity project. Management of the development is entrusted to GHS Gesellschaft für Hafen- und Standortentwicklung mbH (today’s HafenCity Hamburg GmbH). It is also responsible for the special “city and port” fund under public law, in which land for the future HafenCity owned by the city is placed. Sales of this land are to be used to finance the future development activities of GHS such as site clearance, infrastructure planning, investor acquisition, a large proportion of public realization activities, and communication. With the adoption of the Masterplan, the Senate Commission for Urban Development, Environment, Economy and Transport puts in place the framework for HafenCity. The result of the international competition of ideas for development of HafenCity (draft masterplan) is decided. The international jury declares Hamburgplan the winner, a Dutch-German team with Kees Christiaanse / ASTOC. The winning features of their design are the way it opens up HafenCity towards the Speicherstadt, the impressive variety of urban typologies, clever partitioning into neighborhoods, as well as the concept’s inherent flexibility and adaptability. The HafenCity Masterplan, formulating the urban development concept for HafenCity, is approved by the Hamburg Senate. The plan includes statements on urban typologies and use structures, infrastructure provision and implementation phases. The Masterplan is laid open to public discussion through exhibitions and a series of talks. HafenCity makes its first appearance at the MIPIM international property fair in Cannes. Results of the first architectural competition for a new building in HafenCity are decided: SAP is to build a branch office on Grosser Grasbrook. HafenCity information center opens in Kesselhaus. An eight by four meter model of HafenCity in the Speicherstadt’s restored former boiler house gives visitors an idea of the current status of projects in HafenCity, its history and Masterplan (open Tue-Sun 10am-6pm, closed Monday). Eight European architectural firms develop plans for the development of Dalmannkai in a series of workshops; the goal is a fine-grained mix of mainly residential and work-related uses on the waterfront. The first pile is rammed for the Kibbelsteg bridges, marking the start of construction of HafenCity’s new infrastructure. The double-level bridges provide a new direct route for pedestrians and cyclists between today’s Hamburg city center, the Speicherstadt and HafenCity. The bridges perform a vital function: in times of flooding they will offer emergency services, police and rescue vehicles a safe route into HafenCity and are therefore indispensable to its non-port use. The public discussion forum “HafenCity Dialogs in Kesselhaus” is launched and runs in parallel to the planning process from this point on. 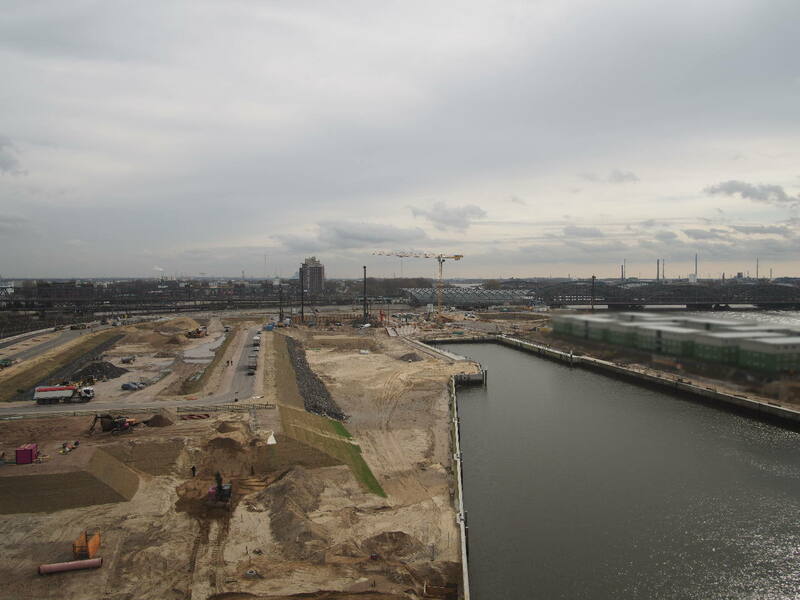 The ground-breaking ceremony is held for the first new building in HafenCity. A new office building and training center for SAP AG is to be built in Grosser Grasbrook by the Häussler group. The six-story new-build is designed by Hamburg architects Spengler + Wiescholek. When the building is completed at the end of 2003, some 500 co-workers move into new office space. Hamburg’s first Inline Marathon begins, with around 2,500 skaters circulating through HafenCity. Am Sandtorkai 54, a building designed by Jan Störmer Architekten, is awarded first prize in the German architects’ association (BDA) Hamburg architecture prize for 2005. The Museum bridge across Brooktor harbor (Architect: Dietmar Feichtinger; Engineers: WTM Engineers; Client: “City and Port” special fund under public law / HafenCity Hamburg GmbH) is named “Building of the Year 2007” by the Hamburg architects’ and engineers’ association (AIV). The Hamburg firm of MRLV Markovic Ronai Voss Architects simultaneously receives a special prize for the conversion of Kaispeicher 9 into the International Maritime Museum Hamburg. For the residential construction category of “Best Projects 1989 - 2008”, the annual publication “Architecture in Hamburg” selected five buildings in Sandtorkai: Ocean’s End (Böge Lindner Architekten), H20 (Spengler Wiescholek Architekten), Dock 4 (ASP Schweger Assoziierte Gesamtplanung GmbH), Harbour Cube (Professor Marc-Olivier Mathez) and Harbour Hall (APB Architekten Beisert Wilkens Grossmann-Hensel). For the public and open space category, the annual also picked out the landscaping of building plinths in Sandtorkai by Behnfeldt Herrmann Franke Landschaftsarchitekten. The Oval, an eleven-story residential tower on Kaiserkai, is dubbed “Building of the Year 2008” by the Hamburg architects’ and engineers’ association (AIV). The design of the Oval is by Ingenhoven Architekten; the developer was Imetas Property. HafenCity Hamburg GmbH is awarded the property brand prize for 2009 in the “best marketing of an economic region” category. At the World Architecture Festival Awards in Barcelona, the Unilever building is selected as the world’s best office building. It was not just the building’s optical and ecological qualities that convinced the judges, but its public character: it opens itself to the surrounding district through its freely accessible atrium. In July, the Unilever building also won the BEX award for especially sustainable, innovative and efficient architecture. The Marco Polo Tower (Behnisch Architekten) on Strandkai in HafenCity wins the European Property Award in the “best high-rise development” category. An international jury of exports from the real estate, construction and design sectors, as well as the specialist press and sponsors, awarded the Marco Polo Tower five stars: the highest accolade in this category.